With great pleasure I write to you from Mendoza, Argentina. I am the editor of the site "Espacial.org". This site is a scientific magazine with no lucrative aims. 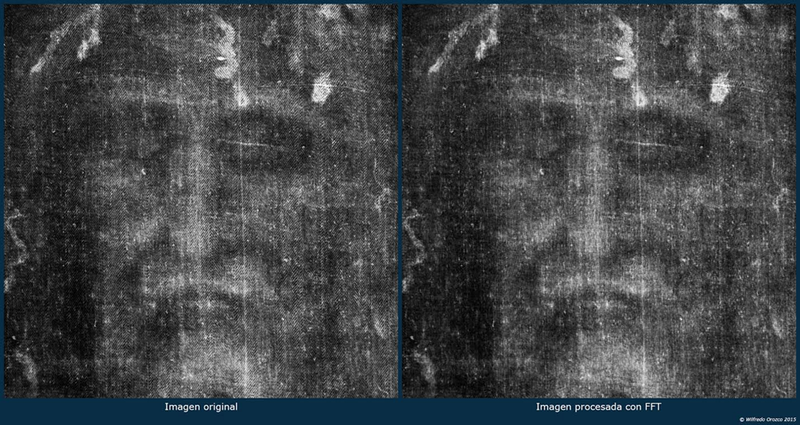 I am sending you an image of the Man’s face of Shroud of Turin. I processed this image using a technique called FFT (Fast Fourier Transform). This technique is used to remove (or attenuate) repetitive patterns from an image (for example the cloth pattern of Shroud of Turin). The program was written in C++. I think the result is very good. I hope that this image is to your liking! I’m wondering if the program is available? Would it be useful to others? Thank You. The FFT process does clear up the image a bit. A new example on how Shroud research moves in circles. FFT is a standard technique used in image processing. It was used by Marion many years ago and it is even included in ImageJ a sofware everyone here seems to use proficiently………….The post by Dan seeems to suggest that this technique can be helpful in the future. In a few weeks times the circle will move ahead and some will express their skepticism on any result (such as Marion’s) about letters or symbols obtained from computer techniques, including for example FFT. Marion, and Castex, and Frale (collaborating with Castex). Orozco is not looking for letters, yet. Good effort. But nothing new. As Gabriel mentioned, such filtering can be done in other freely available programs such as ImageJ (Process >FFT>Bandpass Filter). But I don’t want to discourage, contrary, looking forward to more contributions. Very infomrative about applications of FFT for image clearance. Firstly, Orozco’s ‘imagen original’ only shows one of the two dark stripes on either side of the face that some people think are miscolourations in the threads rather than in the image. I wonder why, or how, this particular image was used. Secondly, one has to be very precise about exactly what any particular FFT does. The weave of the Shroud means that the image appears largely on the warp threads, and not on the weft. Thus the warp threads are darker than the weft threads. However, in any photo, the weft threads appear the darker, because they are in shadow, forming ‘valleys’ between the warp thread ‘ridges.’ If we wish to remove the diagonal striping, we can average out the colour between say, a weft thread and one or both of its adjacent warp threads, or we could lighten the weft threads until they match the colour or intensity of the warp threads on either side. The latter would be preferable. 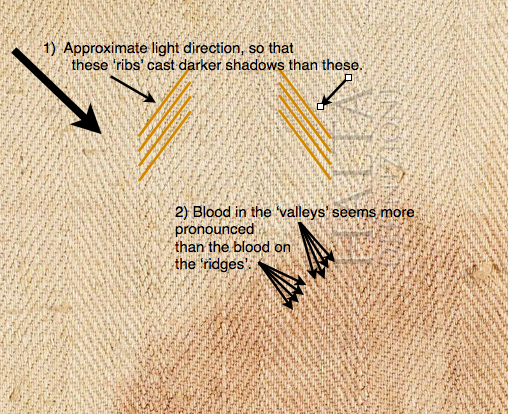 What’s more, such ‘blood’ as remains on the Shroud is largely confined to the ‘valleys’ between the ‘ridges’ having been abraded from the more superficial threads, so that weft ‘bloodstain’ threads really are darker than ‘warp’ bloodstain’ threads, as well as appearing darker anyway because of the shadow effect. To achieve a uniform ‘blood’ colour, it would be better to lighten the weft a little to remove the shadow, and then to darken the warp to replace the blood where it has been worn off. I would like to know what exactly any particular FFT achieves in real terms. Using a negative (and a black and white one at that) means that one is in danger of manipulating artefacts of the photo rather than understanding what, and where, the image actually is. Agree. It sounds like a R. I. T students assignment to understand low pass filters. I’m curious Hugh if you would expand on your blood observation. It is based on the ImageMagick software, which I think is better than ImageJ. I concur I have noticed this on the several macro photographics from the Guilds archives. Correct me if I’m wrong. Your explanation seems to believe that the blood abraded from the superficial warp threads. Can it also be possible the material had a different absorption rate between warp and weft? That’s also possible. Being a liquid (if it was flowing, and not the mysterious damp transfer sometimes considered) it would congregate in the ‘valleys’ more than the ‘ridges’ anyway. Mr. Farey – Where did you notice that blood in the Valleys more than Ridges – on the dorsal image or on the frontal image or on the both images? It seems to me to be much the same on both sides. I chose the spear wound for illustration, but the ‘blood belt’ across the back shows very similar coloration. Sorry to trouble you Mr Farey – Did you notice this on negative (original image) or positive image? As you can see from my picture above, whenever possible I like to use the best photo of the cloth as it is, and and not a black-and-white negative. The extract above is from Shroud 2.0, which is the best available representation at the moment. Hugh, the weave structure applies to the negative images of bloodmarks as well.